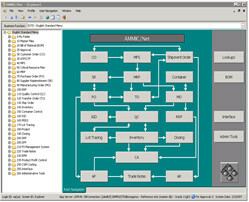 Manufacturing Management System [AMMIC/NetP]｜Manufacturing and Cost Management System's Ammic. AMMIC is designed to handle all manufacturing process from discrete to continuous/process batch specially keeping in mind Japanese standard practices. This flexible system allows the users to handle different manufacturing processes which other systems cannot do easily. Purchasing, manufacturing, and transfer to several factories are possible to control in one system. By integrating the business locations and infrastructures of the manufacturing company, whether it’s overseas or domestic, regardless of its location type, purchase, manufacturing and transfer to several factories can be easily controlled and handled. By correlating certain orders, flexible and efficient manufacturing can be achieved. The system is capable of handling 4 types lot control. Varied control level for each business location or each item can also be set. Alerts for Delivery date delay or quality inspection error can be set to send to specific persons via email or message. Purchasing, manufacturing, and transfer to several factories are controlled in one system. Integration of several sites as own company, associated company and subcontractor, purchase control, manufacturing control, transfer control, quality control and cost control are possible. It is a comprehensive manufacturing management system which includes the associated companies and suppliers for supplier replenishment, supply for a fee and VMI (inventory control by supplier) as well. Invoice No. control is included which is part of the Japanese business practice. It is also possible to print out the invoices for all transactions. 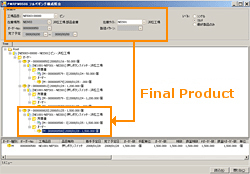 The relationship between the lower level order, which is created by MRP, and the upper level order of final product can be displayed. By specifying a certain purchase order, the manufacturing order for the final product of the highest level can be generated. Information such as delivery date delay or quality problems can be easily spotted as early and quickly as possible. Scheme to process large volume info in high speed has been included. With 2 types of MRP calculation such as Net-change and re-generation, management operation becomes efficient. Efficient processing of sales order is possible with online MRP. Includes parallel calculation process accelerator (*option) which meets large enterprise/global company's expectations. By coordinating with the QC module, handling 4 types of lot control (full-lot/site-lot/soft-lot/no lot-control) is possible. When management control level varies for each factory, lot control level can be set for each factory. Considering input load and accuracy which can be a challenge to the business, flexible setting of the control level for each product item is possible. The package controls the quality assurance of all manufacturing process. This also supports GMP which ensures quality standards are followed. Flexibility in adapting to industry specific manufacturing management. It can flexibly adapt to different management functionality which varies by several factors such as product item, expansion of production base, or supply-chain situation. With our extensive ERP development experience specific to the manufacturing industry and by keeping ourselves updated with the latest technology in manufacturing, we can easily adapt to your industry in a short span of time. Also, thanks to the highly flexible module structure of our system, our customers can undergo business expansion at a lower cost. Its capability has been verified by the number of long term clients we have. Thanks to the highly flexible module structure of our system, our customers can undergo business expansion at a lower cost. Its capability has been verified by the number of long term clients we have.